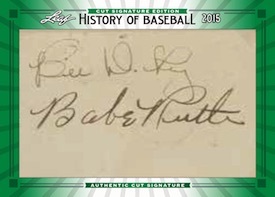 2015 Leaf History of Baseball Cut Signature Edition is another in a line of Leaf products that focus solely on cut signatures. 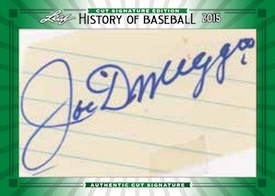 Exclusively featuring Baseball Hall of Fame members, each box includes one cut autograph. Although every card includes a large cut signature as the majority of the card, the product utilizes Leaf's Metal technology on the frame, including a green-heavy design. Providing additional protection, each cards is slabbed. All cards are numbered to 50 or less. It’s another leaf repacked product. It has a good price point on it though at less than 60$ a box but you get the same 10 HOFers over and over again. If you enjoy nice cut autos that are slabbed it’s worth it to buy a few.